Pack the hat and the sunscreen, get the thongs and cozzies on and enjoy Sydney's summer at a watery wonderland of fun for the whole family. This season sees inflatable play lands cropping up all over the city and the suburbs in addition to permanent installations. 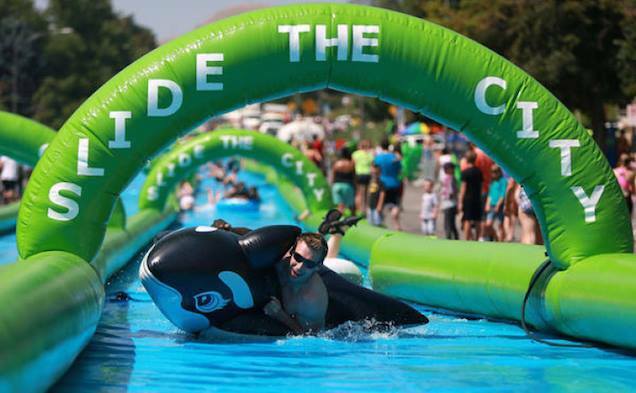 Just south of the city at Centennial Park you'll find Slide the City, where 300 metres of soaking fun awaits during the heat in January. Slip and slide your way to enjoyment and cool down at the same time. Unleash your inner child at this water party event taking place over 2 days (15-16 Jan) with music, food and drinks to boot. Inflatable tubes to ride will be provided as part of the cost or you can bring your own colourful tubes as well as floaties, buckets and water guns. The slide is well padded but you must be over 5 years of age and a minimum height of 1.168 metres (46 inches) to participate. There will be wave timeslots and you can pre-book these. Get in early to get your preferred time and pick from single slider, triple slider or ultimate slider. You get a mouthguard and, with the ultimate slider, you also get an upgraded tube. Prices range from $15-60, depending on how many times you want to ride the waves. Visit www.slidethecity.com.au for more info. 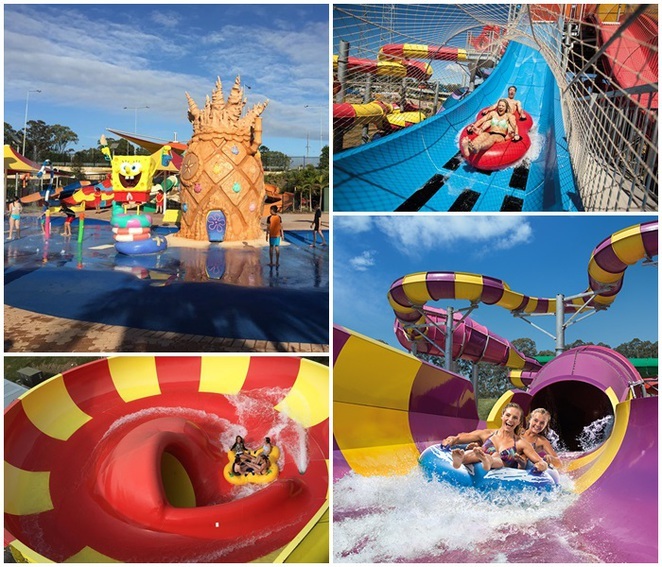 Over at nearby Moore Park in the Entertainment Quarter Showring is Waterworld Central, a mobile water park with giant inflatable pools and the ride of your life awaiting on the Dino Slide. This temporary wonderland will also pop up in Sydney's west at Blacktown International Sportspark, Athletic Field. 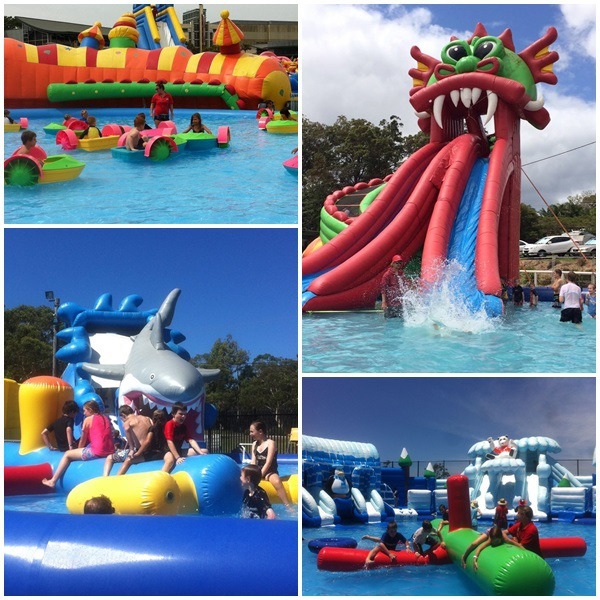 You can walk on water in zorb balls or race your mates down the dragon twin slides, bob around with your bub, paddle and play or slide through shark's teeth. There's lots of fun to be had with sideshow games and more. Both sites have a 3 hour unlimited rider wristband available that will set you back $25 per person. You can pre-purchase at www.waterworldcentral.com.au. Session times are from 10am-1pm, 11am-2pm, 12pm-3pm and 1pm-4pm. Any adult or child not using attractions has free entry. Moore Park site opens 28 December and Blacktown opens 29 December with both running until 26 January. Closed New Year's Day. Bella Vista Farm in The Hills area is also getting a temporary water paradise that will provide plenty of summer amusement. Centred around a huge wading pool will be inflatable slides, obstacle courses, climbing spaces and lots of room to bounce and splash around in. For those that are not water lovers, there's carnival rides to enjoy. Food and drink kiosks available as well as shaded seating. The cost is $30 per person for a 3 hour time block. Carnival rides are $10 per person. Free for spectators. Open for a month, from Boxing Day to Australia Day, 10am-7pm. 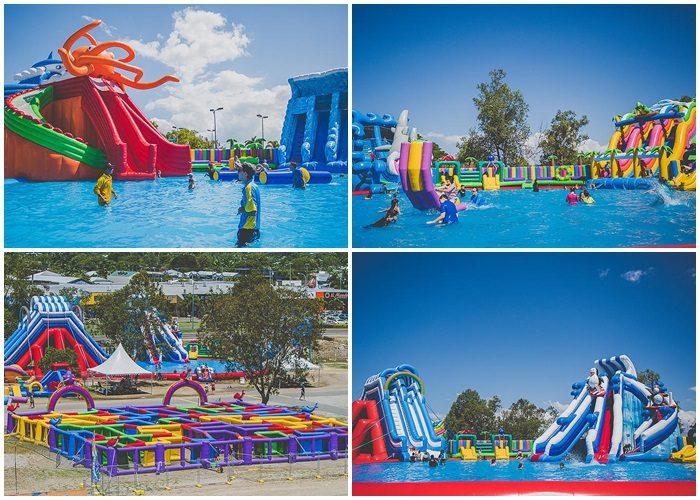 Check out www.waterwonderland.com.au for further details. At Rouse Hill, the Sydney Hills City Slider will take over Withers Rd between Annangrove and Mile End Rds. Similar to the one at Centennial Park, this one is actually a bit longer, coming in at 325 metres in length. The size of 3 city blocks, it will also have inflatable tubes to ride. Spectators are free but riders will need a ticket. Limited early bird tickets available from $29, else cost is $35, plus booking fee. There will be 6 sessions between 9am to 8.30pm with each session lasting 90 minutes. One day only, 27 December, so get in before it gets sold out. Purchase at www.thecityslider.com.au. A 25 metre mini slide for kids under 110cm in height will allow the littlies to enjoy the fun as well. Year round Aquatic Centres also provide more than just your average swimming pools these days. There's slip 'n' sliding at a number of them and zorb balls. One of the best is at Sydney Olympic Park with a splasher's water playground, a water slide and a rapid river ride. Check it out at www.aquaticcentre.com.au. 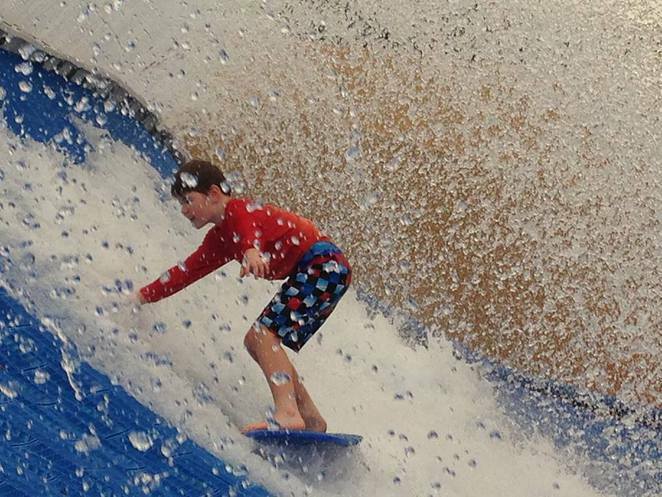 For indoor surfing, yes indoor, visit Ryde Aquatic Leisure Centre for their new heated Surf Ryder wave simulator pool attraction. You can stand-up surf or bodyboard through different size waves and shapes in 30 minute sessions. Boards are provided and trained instructors are on hand. Cost is $18.50 per person, which includes pool entry. Full details at www.ryde.nsw.gov.au/RALC. Further out west, where it's even hotter, the aquatic adventures of Cables Wake Park at Penrith will help you to keep cool. Part of the Panthers Complex, it features a range of activities around 2 main cable lakes where you can water ski, wakeboard or kneeboard. Tailored programs cater to both beginners and the more advanced. 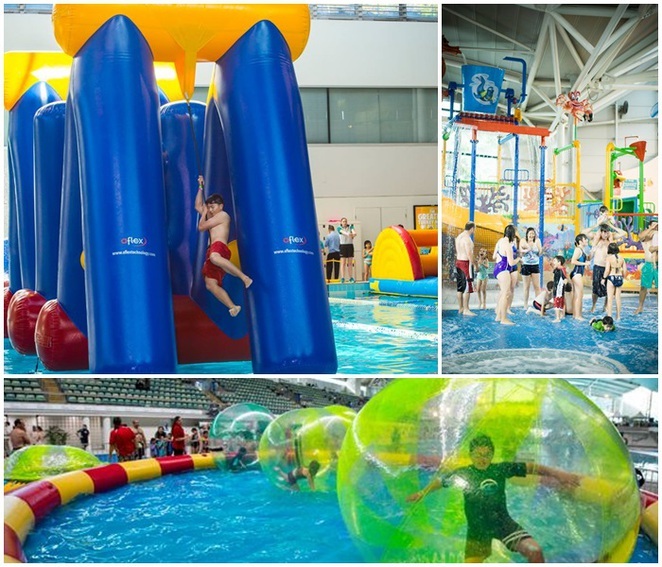 For younger children, there's a jumping pillow, play gym and an aqua park on the water featuring trampolines, inflatable slides and obstacles. Play basketball or volleyball for free - exercise for the day ticked off. Afterwards, relax at the cafe on the verandah or make use of the free barbecues. 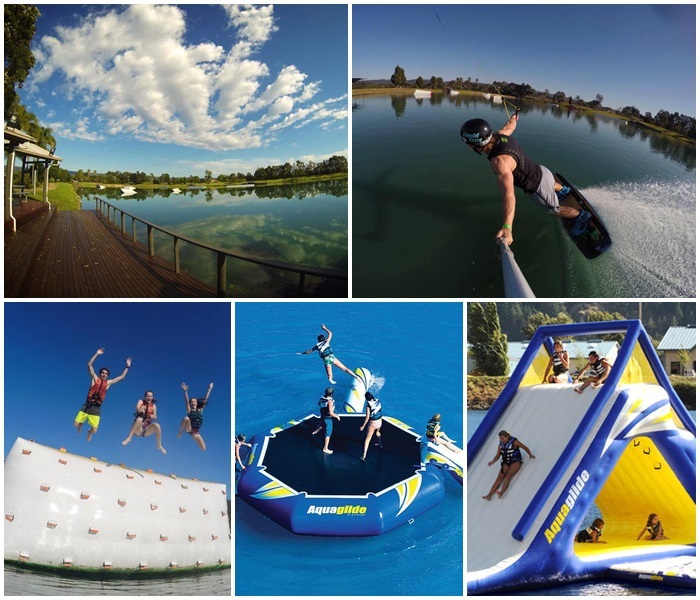 For prices and opening times, go to www.cableswakepark.com.au. Another permanent fixture is the well known, Wet 'n' Wild at Prospect. With over 40 slides and attractions, there's something for everyone. Strapped in a harness, free fall from higher than the Opera House or show off your skills at the Surf Deck. Experience the 360Rush with friends as well as high speed fun on Riptide and the Aqua Tube. Ride the typhoon or hang out at Nickelodeon Beach. In addition to the usual fun, during December and January, chill out sessions on Sundays from 3pm allow you to listen to some tunes in between your sliding and as the afternoons become evening, from 1-23 January, you can enjoy 'Cinema in the Sand' under the stars. Lounge around on your beach towel or deck chair and catch a movie suitable for the whole family. It's on Fridays and Saturdays from 8pm. Visitor info including opening hours, ticket prices, services and facilities can be found at www.wetnwildsydney.com.au. So grab the family, have a picnic, cool down and make it an unforgettable summer. Didn't know about indoor surfing at Ryde Aquatic Leisure Centre. And its heated - sounds pretty cool. I didn't know these water wonderlands existed here (aside from Wet 'n' Wild), thanks for that.